The Holy Hierarch Nicholas the Wonderworker was born in the city of Patara in Lycia. His parents, Theophanes and Nona, were pious, noble and wealthy people. This blessed couple was given a great honor to plant a holy seed in their family that was “like a tree, planted in water, that brings its fruit on time” (Ps 1:3). When the boy was born the parents named him Nicholas which means the winner of all people. And he, with God’s blessing, was truly the victor over the evil, and defended the well-being of the world. Immediately after giving birth to him, his mother Nona was healed of sickness, and stayed fruitless until her very death. By this the nature itself showed that this woman could never again have another son like Nicholas, he had to be the first and only one. Consecrated already in his mother’s womb, he proved to be God’s servant before he saw the light and worked miracles before he accepted the natural nourishment of a child, fasted before he started to eat. From the day of his birth he revealed his piety and grace. During his baptism he stood on his feet for 3 hours, without anybody’s support giving grace to the Holy Trinity, Whose servant he was to become. He accepted the milk only from his mother’s right breast, and on Wednesdays and Fridays he accepted his mother’s milk only once, after his parents’ evening prayers. His mother and father were very surprised and foresaw that their son would fast a lot in his life. Throughout his life Saint Nicholas kept a strict fast Wednesdays and Fridays. Year after year he became more and more virtuous learning from his pious parents. He was like fruitful earth accepting and returning a good seed of knowledge and showing each day new signs of wellness. When it was time for him to learn Divine Scripture, Saint Nicholas perceived as much with the power of his mind and the help of the Holy Spirit as should a good pastor of his flock. Upon reaching perfection in learning he proved to be perfect in the life itself. He avoided vain friends and talks, especially with women. Saint Nicholas kept chastity and hardly left the church, praying to God with an open mind, following the Psalms “I wish to be at the threshold of God’s home” (Ps 83:11). During night and day he did not leave the church, praying and reading books, building within himself a worthy home for the Holy Spirit: “ye are the temple of God, and the Spirit of God dwelleth in you” (1 Cor 3:16). The Spirit of God truly dwelled in that virtuous and kind young man, in serving the Lord his youth was on fire with the Spirit. Saint Nicholas did not have any habits characteristic of youth: in his mind he was like an elder and evoked amazement and profound respect on the part of the faithful. If an old man enjoys the pleasures of youth, he looks ridiculous, and if a young man has a mind of an old man he is respected by all. Being young in the old age is not appropriate, but being old in one’s youth is splendid. I see, my flock, the new sun rising above Earth, the consolation of the suffering. Blessed will be the flock who will have him as the pastor, for he will save the souls of the lost, fill them with piety and come to their aid in sorrow and grief. This prophecy came true, as our story will show. The presbyter Nicholas was constantly working and remained in prayer and fast without ceasing. Being a mortal, he tried to act like an immortal. Living an angel-like life, he was worthy of administrating the church. Upon setting out to venerate the holy sites in Jerusalem, the bishop of Patara entrusted the administration of his flock to St. Nicholas, who assiduously carried out his assignment with love. Soon his parents passed away, leaving him their possessions which St. Nicholas gave to the poor, for he didn’t care about the transitory wealth. Denying the worldly desires he tried to devote himself to the Lord, saying: “My soul, dear God, is turned to you. Teach me to serve you, for you are my Lord. You are my savior and my only Lord”. (Ps 24:1, Ps 142:10, Ps 21:11). Nicholas showed great charity toward his flock, coming to the aid of the suffering, and giving all he possessed to the poor. In Patara there was a rich and noble man who lost all his money quite suddenly and was left in poverty. This man had three beautiful and virgin daughters. To save the family from starvation he decided to make his daughters prostitutes. God wanted to save this man and his three daughters from damnation; therefore, he secretly told Saint Nicholas to visit this perishing man to console and help him. Hearing of the bitter need and poverty of the formerly nobleman, Saint Nicholas felt sorry for him and decided to save him from sin. But he didn’t want to do that openly for two reasons. First, he wanted to avoid the mundane fame, following the Gospel: “Take heed that ye do not your alms before men, to be seen of them” (Mat 6:1). Secondly, he did not want to upset the man who used to be very wealthy and then lost all he had. He knew how painful and offensive alms are for people who had passed from wealth and fame to bitter poverty, because they reminded them of the former well-being. So Saint Nicholas did what Christ taught: “let not thy left hand know what thy right hand doeth” (Mat 6:3). He tried to avoid the fame so hard that he decided to make himself secret even to the man he was saving. At midnight the Holy Hierarch threw a bag of gold through his window and returned home. In the morning the man found the bag. At seeing the gold he could not believe his eyes, because he could never expect such a blessing. But then he was sure it was really gold. Rejoicing in surprise, he cried of happiness and thought who could have been his benefactor. He ascribed this deed to God, and did not cease to thank him. He used this money as a dowry for his eldest daughter. Seeing that the money had gone to a good cause, Saint Nicholas returned the second night, and threw another bag with gold into the window, saving the second daughter from sin. The man arose the second morning and found the gold again. Again he was surprised, and falling on his knees he cried in tears: “Oh, gracious God. The builder of our redemption, who saved me with Your blood and is now saving my home and my daughters from the evil with gold, show me the servant of your grace and humane piety. Show me this angel on earth that is guarding us and saving us from poverty, degradation and sinful deeds. Thanks to your grace and generosity of your Holy secret Servant I can marry my second daughter and avoid the net of devil who wanted to multiply my ruin with another foul gain”. Having prayed to God and thanked him for his grace the man married his second daughter. He hoped that the Lord would not leave his third daughter and give her a lawful husband. To find out who brought him gold the father did not sleep for many nights, waiting for his benefactor. Very soon he came. The servant of Jesus Nicholas quietly came for the third time, and stopping at the usual place, threw the same bag of gold and hurried to his house. Hearing the sound of gold, thrown into the window, the man ran after Nicholas as fast as he could. When he caught up with Saint Nicholas he recognized him at once for his virtue and nobility, fell on his knees, kissing Nicholas’ feet and calling him helper and saver of the lost souls. He said: “Had gracious God not saved me with your generosity I and my daughters would have long been burnt in the fire of Sodom. Now we are saved from the greatest sin by You”. He said a lot to the Saint with tears in his eyes. Nicholas elevated him from earth, and made him promise that he would never tell anybody what happened. Then the Saint told him many useful things and let him return home. There were many similar acts of grace, but we told you only of one so that you know how generous he was to the poor. We would never have enough time to tell you in detail about his grace to those in need. Telling them to stay calm and trust in God, the Saint started to pray violently. Immediately the storm subsided, all was quiet and grief turned into common joy. The rejoiced sailors thanked God and his Servant, Saint Nicholas, and were astonished at his prediction and the cease of the storm. Then one of the sailors had to climb a mast to fix the sails. On his way down he fell to his death on the deck of the ship. Saint Nicholas, ready to help before people asked him to, resurrected the sailor with his prayer, and the latter woke up as if he was sleeping. With God’s help the travelers reached Alexandria. Many sick people came and were cured there. In Jerusalem Saint Nicholas ascended Golgotha and gave thanks to the Savior of mankind. He bowed down and prayed at all of the holy sites. At night, upon the approach of the great pilgrim, the locked doors of a church opened by themselves before the Saint who could enter the gates of Eden. Having stayed in Jerusalem for a long time, Saint Nicholas decided to go off into the dessert, but was stopped by a Divine voice directing that he return to his homeland. The Lord who cares about our well-being did not want that the light that was to shine in Lycia stayed covered in the dessert. Thus wanting to return home, Saint Nicholas went to the docks seeking passage. But the sailors meant to lie to him and turned their ship toward another country. When Nicholas noticed that the ship was not going to his homeland, fell on his knees and begged the sailors to direct the ship to Lycia. The sailors did not pay attention to his pleas and carried on; they didn’t know that God would not leave his Servant. Suddenly a storm came that turned the ship and quickly carried it to Lycia, threatening to kill the evil travelers. Thus Saint Nicholas finally returned to his home. The Saint did not punish the sailors. He even blessed them and said that they would return safely to their homes. Upon his return to Lycia the Hierarch joined the brotherhood of a monastery founded by his uncle, the Bishop of Patara, known as Holy Zion. The brothers accepted him with great love like a God’s angel; they enjoyed his pious words and tried to follow his angel-like way of life. Drawn to a life of silence, Saint Nicholas hoped to stay there until his death. However, the Lord once again announced to him that a different path awaited him, for he didn’t want that such a treasure be covered. Once while praying the Saint heard a voice from above: “Nicholas, if you want to be my glorious Servant, work for the welfare of the world”. When the Saint heard that, he started thinking what was God’s will and then he heard again: “Nicholas, this is not a field, from which I expect you to bring forth My expected fruit. Turn and go back into the world, so that My name will be glorified in you.” So Nicholas understood that God wanted him to leave the path of silence and save people from the evil. There was time to decide for Saint Nicholas whether to return to his homeland, the city of Patara, or move to another place. Fearing the fame that would surround him in Patara, he wanted to lie in a different city where nobody knew him. There was a city of Myra in Lycia, and there came the Saint, directed by God’s will. Nobody knew him there, he lived like a poor without a place to sleep. Only in the church he found his only refuge. At that time John, the Archbishop of that city, died, and bishops of Myra gathered to choose a worthy successor. There was a big disagreement between them and, some of them, moved by God’s will, said that it is not people who should make this choice, but God. “We should pray for God to tell us who deserves to be the Archbishop of Myra and be the pastor of all Lycia”. So the bishops prayed and fasted. God, who hears the wishes of those who fear him, opened his will to the oldest bishop. When the bishop was praying, an angel appeared to him and told him to go the door of the church and watch for the first man to enter it. He said: “He is my chosen one. Accept him and make him archbishop: his name is Nicholas.” The bishop told the others of his vision and they prayed with bigger zeal. The bishop who saw the vision went to the place shown to him in the vision and waited for the man. When it was time for the morning service, Saint Nicholas was the first to come to the church, for he always woke up at midnight to pray and therefore came to the service before all the others. This morning an aged bishop awaited him in the sanctuary. “Who are you, my son?” he asked. Nicholas was silent. The bishop repeated his question. The Saint then said quietly: “Nicholas, the sinner. And I am your servant.” A pious bishop, hearing this answer, understood that he was indeed the man chosen by the Lord. For he knew that God favors the meek, the silent, and those fearing God’s word. He rejoiced and taking Nicholas by the hand told him to follow. When he brought Nicholas before the other bishops, they were consoled and happy that they now had an Archbishop chosen by God himself. They brought him to church and the bishop who saw the vision, addressed to the people: “Brothers, accept this pastor, chosen by the Holy Spirit, entrusting him to care about your souls. Now we have what we wanted, found and accepted. Under his administration we will face God upon his appearance and afflatus. And people thanked God and rejoiced greatly. Nicholas who never liked praise, denied the post for a long time; but then yielded to the pleas of the council of bishops and all people, accepted the archbishop’s post. He was encouraged by the Divine vision that he had seen before archbishop John died. This vision was told by Saint Methodius, the patriarch of Constantinople. Once, said he, Saint Nicholas saw at night the Savior standing right in front of him and giving him the Gospels, decorated with gold and pearls. To his other side Nicholas saw the Most-Holy Mother of God giving him an omophorion. In several days after this vision the archbishop of Myra died. Remembering this vision and seeing in it God’s benevolence, Nicholas did not want to turn down the pleas of people and accepted the position. The council of bishops and the clergy consecrated him and celebrated God’s gift – pastor Saint Nicholas. So God’s church accepted the light that was not hidden but placed as archbishop where he was to be. Saint Nicholas remained the same great spiritual struggler and manifested to his flock the word of truth and faith. When he became a pastor Saint Nicholas told himself: “Nicholas! Now you should live not for yourself but for others.” Willing to teach his flock to live in virtue he did not hide, as before, his virtuous way of life. He used to live being God’s secret Servant so that He would be the only one to see his heroic deeds. Now his life was open but not because of his vanity, but to multiply the glory of God and to follow the words of the Gospels: “Let your light so shine before men, that they may see your good works, and glorify your Father which is in heaven.” (Mat 5:16). Saint Nicholas was like a mirror for his flock in his good deeds, and, as an apostle said: “a perfect example for the faithful in the living, love, spirit, and faith” (1 Tim 4:12). He was meek, kind, humble and avoided all vanity. His clothes were simple, his food, which he took only once a day, in the evening, was Lenten. All day long he was busy talking to people, listening to those in need. The doors of his home were open for everyone. He was kind to everyone, a father for the orphans, a giver to the beggars, a comforter for the crying, a helper for the offended, and a benefactor for all. He chose two pious and reasonable councilors to help him in his administration, both Presbyterian. They were known in all Greece Paul of Rodes and Theodore from Askalon. So Saint Nicholas led his congregation. But the Satan, who never ceased to envy the well-being of the pious people, persecuted the Christian church through the reign of emperors Diocletian and Maximian. They ordered that all citizens of the Roman Empire worship the idols. Those who did not obey were thrown in prison and tortured before they were killed. This devil’s edict soon reached the city of Myra. Saint Nicholas who was pastor of the flock preached God’s piety and was ready to die for Jesus Christ. That’s why he was locked up in prison together with other Christians. He stayed in prison for a long time, enduring hardships, famine, thirst and prison’s cram. He lent his co-prisoners support and exhorted them to firmly endure their bonds, trials and torture, and encouraged them not to give up their faith in God. The Lord kept them from harm and soon all the Christians were set free. The Lord destroyed the ruling of Diolectian and Maximian. The king Constantine the Great, to whom God entrusted the Roman Empire, had a vision of the Holy Cross, and so God raised up “a horn of salvation” (Luke 1:69) for his people. Constantine, placing his faith in God, defeated his enemies with the power of the Fair Cross and destroyed pagan temples and restored Christian churches. He set free all the God’s prisoners and, after praise, returned them to their homelands. So the city of Myra received its bishop, Saint Nicholas, who was offered a martyr’s crown. As a bearer of God’s grace he cured people’s sickness and passions, so many people praised him, and all loved him, for he had a beautiful heart and served God faithfully. At that time there were still many pagan temples, which attracted some of the citizens of Myra. Doing battle with the spirits of evil, the Holy Hierarch visited the pagan temples, smashing the idols and turning the temples into rubble and he did the same with the temple of Arthemide which was very richly decorated. The servants of the Satan could not bear this and had to flee their home. The king Constantine, wishing to strengthen the Christian faith, ordered to hold in Nicaea the Ecumenical Council. The Holy Fathers took up against the doctrine of Arius and himself, and considering the Son equal and one with God, restored peace in the Holy Church. Among 318 Holy Fathers was Saint Nicholas. He was against the preaching of Arius and together with the other Holy Fathers confirmed the doctrine of the Christian faith. Enoch John says that Nicholas loved God so much that he did not only disgrace heretic Arius with his words but also with his deeds, striking him in the cheek. The Holy Fathers were indignant at his behavior and stripped him of his Episcopal omophorion and placed him under guard. But the very God and His Holy Mother approved of his courageous deed and praised his divine zeal. Several of the holy fathers had a vision in which the Lord Himself and the Mother of God consecrated the Saint a bishop, handing him the Gospels and the omophorion. The fathers of the Council, perceiving the Holy Hierarch’s zeal and daring were pleasing to God, glorified the Lord, and restored his Saint to his Episcopal rank. Returning to his diocease, the Holy Hierarch brought it to peace and blessing, sowing the word of Truth, cutting off at the roots incorrect thinking and vain philosophizing, denouncing entrenched heretics and tending to those who had unknownly fallen and turned away from the path. He was truly a light for the world and the salt of the earth, for his life was bright and his word permeated with the salt of wisdom. The pastor cared a lot about his flock in all the needs, and not only in the spiritual field. When the great famine, which befell Lycia, occurred, Saint Nicholas was determined to save his district. There was a ship filled with wheat bound for the Gallic lands. He appeared to the ship’s captain in his sleep and instructed him to take wheat to Myra and sell it there. He handed the captain three gold coins as a down payment. When the captain awoke the next morning he found the three gold coins in his hand. The merchant was very surprised and did not dare to disobey the Saint. He went to Myra and sold his wheat to the citizens, whom he told of Saint Nicholas’ visit. The people praised God and the Saint with joy and happiness. At that time there was a strike in Phrygia. Hearing about it, Constantine sent three military leaders with troops to pacify the revolting country – Nepontianos, Orsos, and Erpillion. They quickly left Constantinople and stopped at one of the ports in Lycia – at Andriaca. The seas were rough and they stayed in Lycia until the weather cleared. Some soldiers, however, started to loot the market place. They did it so often that the locals grew angry, and there were arguments and quarrels between the population and the soldiers. When Saint Nicholas found that out, he decided to go into town. Upon hearing of his coming, the citizens together with the militants went to meet him and bowed. The Saint asked the warriors where they were going. They answered that they had been sent by the Emperor to Phrygia to end the insurrection there. Saint Nicholas requested that the generals restrain the soldiers. Later, the generals were invited to town and shown a hospitable reception. The generals punished the guilty soldiers and were blessed by Nicholas. At that time several men and women came from Myra, crying. They begged Saint Nicholas to save their relatives, who had been unjustly condemned to death by the district’s judge Efstathios, acting for the benefit of evil and envious people. They said: “Our entire city is crying and grieving, our ruler, and awaiting your return. Had you been with us, the court would not have been so unfair.” Hearing this, Saint Nicholas hurried to the place of execution. At the site called “Leo” the Saint met several travelers and asked them about the condemned men. 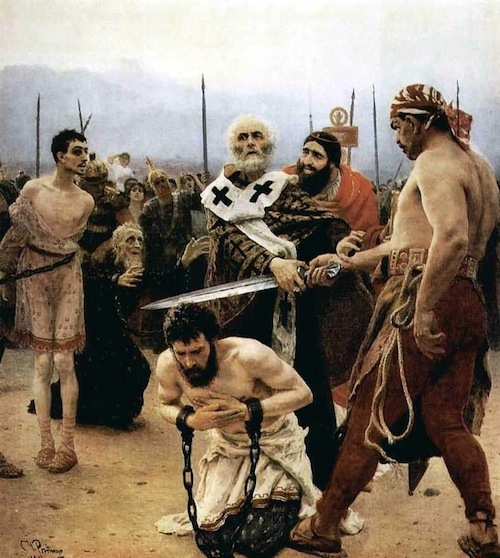 They answered: “We left them when they were being led to the site of execution.” Saint Nicholas hurried even more, wishing to save the men’s lives. When he arrived, there were many people there. The condemned men had their arms tied together, their faces were covered, their necks were bare – they were waiting for the sword. The Saint saw that the executioner, severe and determined, already took out his sword. All the present were horrified and scared. The Holy Hierarch bravely approached the executioner and held back the sword, which was already raised over the heads of the condemned. He did all that with great authority, and nobody dared to stop him because the Divine force directed him in his actions and words. The men, saved from death, cried from joy, and everybody thanked the Holy Savior. The governor Efstathios arrived to the site too and wanted to approach the Saint. However, God’s Servant turned his back to him with contempt, and, when the ruler fell on his knees, the Saint pushed him away. Calling for God’s justice the Saint promised him great suffering for the unjust decision and said he would tell the Emperor Constantine about his deeds. Tortured by his conscience and scared by the threats of Nicholas, the governor begged for forgiveness. Regretting the past and wanting to make peace with the Holy Hierarch, he placed all the blame onto the city’s Patriarchs Simonide and Eudoxy. But his lie could not deceive the Saint for he knew very well that the governor had condemned the innocent because of his greed. Efstathios begged for forgiveness for a long time and only when he frankly acknowledged his guilt, God’s Servant forgave him. The worriers accompanied Saint Nicholas and were greatly impressed with his zeal and piety. Nicholas gave them his blessing and they went to Phrygia to fulfill the Emperor’s order. Having arrived at the place, they suppressed the revolution and returned to Byzantium. Praised by the Emperor and his court, they were even offered membership in the Royal Council. But some people were very envious and approached Aflavia, the city’s governor and told them that the three generals plan to overthrow the Emperor. To make Aflavia side with them they bribed him. So the magistrate approached Constantine and told him what charges were pressed against the three. Constantine had the generals thrown in prison without any investigation. He feared their escape and realization of their plan. The generals remained in prison without knowing why. Fearing that Aflavia would discover that they were lying, the enemies gave him more money so that he would execute the prisoners. Aflavia appeared before Constantine and, pretending he was very concerned about the life of the Emperor, said the following words, trying to arouse the ruler’s anger: “Oh, my Emperor, none of the prisoners has any repentance. They persist in their evil thoughts, please order their immediate execution so that they don’t do any harm to you.” Very scared of such words the Emperor ordered their death. As it was night, the execution was postponed for the next morning. The jailkeeper learned about their destiny and came to the generals and said: “It would have been better for me if I had not known you and had not enjoyed most pleasant conversations with you. Then I would have easily parted with you and not felt so sorry for you in this unhappy situation. With the morning the last and terrible parting will come upon us. I will never again see your dear faces and hear your voices for the Emperor ordered your execution. Tell me what to do with your possession now that you still have time. His speech was mixed with crying. When the generals learned their fate, they were speechless and cried: “What evil enemy could envy our life? Why are we condemned to death? What have we done to deserve such a punishment?” They called the names of their relatives and friends, calling God to witness their innocence. One of them, Nepontianos, remembered how Saint Nicholas had saved the three innocent people from death. They prayed to God to have the Saint help them as well for nobody else could help them. We are facing a great misfortune and we are too desperate to pray for our tongues are burning with grief: “Soon we will be saved by your Divine grace. Please save our souls, our Lord, from those who seek them” (Ps 7:8). People want our death tomorrow, please hurry and save us from unjust death.” God heard the prayer of the generals and that night his Servant Nicholas appeared to Constantine in his sleep. He said: “Get up quickly and set the three generals free. They are innocent because they have been slandered. If you don’t ahear me I will create s revolution, like the previous one, in Phrygia and you will die a scary death”. Shocked by his daring, the Emperor could not understand how the man could have entered his bedroom at night and told him: “Who are you to threaten my and my country?” And the man said: “I am Nicholas, and I am Myra’s Holy Hierarch”. The Emperor was confused and in the morning he was thinking what the night’s vision meant. Saint Nicholas also appeared to Aflavia that night and told him the same. In the morning Aflavia got scared. As he was recalling the vision, a messenger from the Emperor appeared and told him of Constantine’s vision. The magistrate hurried to the Emperor and they were very astonished that they had had the same vision. Immediately Constantine requested the generals be brought before him and asked them: “What magic did you use to make the same dream appear to two different men? The man from the vision was very angry at us and threatened to start another revolt. “The generals turned to each other in disbelief. Seeing this, the emperor said: “Don’t be afraid and tell me the truth”. With tears in their eyes they said: “We didn’t use any magic and did not mean any evil against your power, God is a witness. If we are lying to you and you find that out, don’t have any mercy for us and our kin. Our fathers taught us to respect the Emperor and serve him faithfully. Now we are your faithful guards and have fulfilled all your orders. We have suppressed the revolt in Phrygia, stopped the tensions and proved our courage by our deeds and those who know us well will say the same. You used to praise us and now you are our enemy and have condemned us to death. So, Emperor, we think that we suffer only because of our zeal, and instead of honors and fame we get the fear of dying. Hearing this, Constantine regretted his actions. He was frightened of God’s Justice and was ashamed of his decision to behead the innocent. The emperor was kind to the generals and talked with them very warmly. Suddenly, the three warriors saw Saint Nicholas sitting next to the emperor and showing them with gestures that they have been forgiven. Constantine then asked: “Who is Nicholas and whom has he saved? Tell me all about him. Nepontianos told him everything. When the emperor learned that Nicholas was a Holy Servant of God, he was astonished at his zeal in saving the hurt, set the generals free and told them: “It is not me who is saving your life; it is Saint Nicholas, whom you’ve called for help. Go and thank him. And tell him I did what he had told me, and let him not be angry with me. He gave the generals a golden Gospel and incense burner to take to the church where Saint Nicholas has been ordained. The generals set off at once. When they arrived at Myra, they were overjoyed to see the Saint once again. They gave him their thanks and after giving generous alms to the poor they departed and successfully returned home. These were the Divine miracles of Saint Nicholas. The word about them traveled the world and there was not a place where the miracles of Saint Nicholas which he worked with the Grace of God were unheard of. Once there were some sailors who were endangered during a storm at sea. Their masts were broken, the ship was almost under the water, and people were desperate. Then they remembered the Holy Hierarch. They had never seen him, but they heard of the miracles of Saint Nicholas and how he had helped those in need. They knelt in prayer. The Saint immediately appeared to them and said: ”You called me, and I am with you. Do not fear!” He took the helm. Just like Jesus Christ once told the storm and the sea to quiet down, Saint Nicholas told the storm to subside, remembering the words of Jesus: “He that believeth on me, the works that I do shall he do also” (John 14:12). So the Servant of God ordered the storm and the sea, and they were obedient. The sailors then stopped at Myra. They went to town wishing to see their Savior. They saw the Saint on their way to the church and, recognizing him, fell on their knees, thanking him. Saint Nicholas did not only save them from death, but took care of their souls. He saw their sin that was bringing them away from God and told them: “I beg you, my children, to think and correct your thoughts and deeds to please our Lord. For, even if we hide our deeds from other people, we can not hide anything from God. So try hard to guard your soul and body from sin. ”If any man defiles the temple of God, him shall God destroy; for the temple of God is holy which temple ye are”. (1 Cor 3:17) Then the Saint blessed them for he loved people, and he possessed Divine goodness. People could see it on his face and those who were tortured by a passion or grief were consoled just by looking at him, those who talked to him, grew more and more kind. Not only Christians but also people of other faiths, hearing his words, accepted the word of truth in their hearts and took the right paths. The men did so Immediately the air was filled with black smoke and fire from the vase, the sea boiled and the water drops were like sparkles. The people on board grew very scared and screamed, but the Saint told them not to fear and suppressed the storm and made the journey safe. The travelers reached the city and thanked the Saint in the church where his relics were. Then they returned to their country, telling everyone what had happened to them on the way. Many miracles worked Saint Nicholas at sea and land. He helped those in need, came to aid of the sailors drowning at sea, set free the imprisoned, brought them home, saved from the sword, saved people’s lives, cured, fed, gave ears to the deaf, legs to the limbed, eyes to the blind. He made the poor people rich, made the hungry full, and now he still comes to the aid of those who call for his help. It’s impossible to innumerate his miracles and describe them. The East and the West know Nicholas, the Wonderworker, let the Holy Father, Son and Spirit be blessed in his Holy name. Amen.